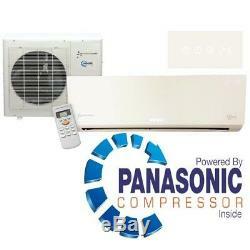 12000 BTU PRE-CHARGED WHITE GLOSS INVERTER WALL SPLIT AIR CONDITIONING UNIT POWERED BY A PANASONIC COMPRESSOR. These pre-charged EASYfit split air conditioning units, have two parts, which are an internal unit, as well as an external unit. The internal unit is is for fitting to a wall, with the metal mounting plate, which is provided; whereas the external unit is fitted just outside of the building. Please note we sell an optional extra "wall bracket" for the outdoor unit. Both of the two units (the indoor and outdoor unit) are then connected via the copper pipe that is provided with this system. Please note that 4 metres of cooper pipe is provided with this kit. The external unit, which is the condenser part, this removes the heat from inside the room and then carries it outside, along with any condensation that has built up inside the system; whilst the internal unit provides the cooling. Please note that these inverter units have a "heat mode too", and this can be used for heating a room, if required. Please also note that it is only the compressor which is the Panasonic part. The actual air conditioning unit itself isn't Panasonic. Features Of These Pre Charged Air Conditioning Units. Powered by a Panasonic Compressor. Pre-gassed inverter air conditioning unit which can cope with up to a maximum 6 metre pipe run. Unit is supplied with a hand held remote control. Fan speeds are adjustable for rapid cooling or to minimise noise. Heat pump models provide the choice of both heating and cooling. Oscillating air vanes for dissipation of cold air. Built in timer feature which will turn the unit on and off automatically. High efficiency air filters which remove odours and particles. Anti-mould coating for hygienic operation. Digital display to show the operational settings and temperature. A "Smart Air" feature which will bring up previous settings at the push of a button. Cooling capacity: 12000 BTU (3.5kw). Cooling current input: 4.7A. Heating capacity: 12000 BTU (3.5kW). Heating current input: 4.5A. Automatic restart feature after power failure. Maximum room size unit is suitable for: 16 - 30 square metres. Maximum conservatory size unit is suitable for: 15 square metres. Indoor Airflow (m3/hour): 550 maximum. Noise level: 30-40 dB(A). Dimensions: 800 x 280x 190mm. Dimensions: 812 x 256 x 540. Unit supplied with 4 metres of pipe. Selectable temperature range: 17-30 degrees C. The item "EASYFIT KFR-33IWithX1CM 12000 BTU WHITE GLOSS INVERTER AIR CONDITIONING UNIT" is in sale since Wednesday, January 2, 2019. This item is in the category "Home, Furniture & DIY\Heating, Cooling & Air\Air Conditioners & Heaters\Central Air Conditioners". The seller is "innovate-electrical" and is located in Romsey. This item can be shipped to United Kingdom.